When the Patriots mounted their historic comeback to earn an overtime victory over the Falcons in Super Bowl LI, a zoo in Atlanta lost a bet and had to name an animal after a GOAT. Meet Tom Brady, the cockroach. Zoo Atlanta wrote on Facebook Monday that it had lost a bet with Roger Williams Park Zoo and Carousel Village in Providence, Rhode Island. The loser was required to name a baby animal after the other team's star quarterback. 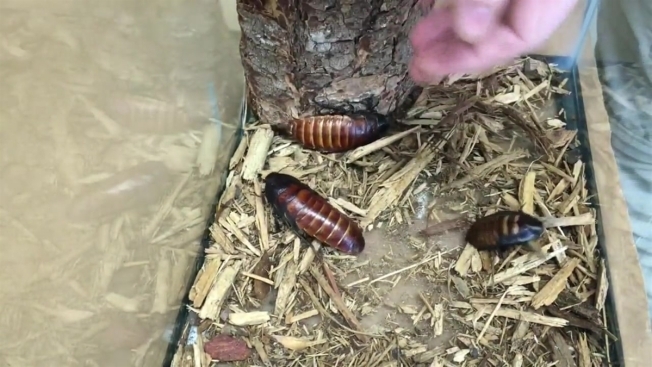 "Figuring the losing side would be pretty bitter about it, we came to the agreement that baby animal ... would be a Madagascar hissing cockroach," Zoo Atlanta's post read. The zoo shared video introducing the Brady Bunch — including two large cockroaches named Mike and Carol, followed by Greg, Peter, Bobby, Marcia, Jan and Cindy — but the tiny cockroach that showed up later wasn't Cousin Oliver. "Of course, we don't want to forget our final member of our family, our littlest baby of them all," a woman said in the video. "I'd like to introduce Tom Brady." Gavin Johnson of Zoo Atlanta confirms the species was agreed upon beforehand, saying Roger Williams Park Zoo would have named a Madagascar hissing cockroach after Matt Ryan if the Falcons had maintained their third quarter lead of 28-3. But Brady and the Patriots rallied late to send the game to overtime, winning it 34-28. Either way, New Englanders have the real Tom Brady and his extensive jewelry collection to comfort them. So ... "Roger that."